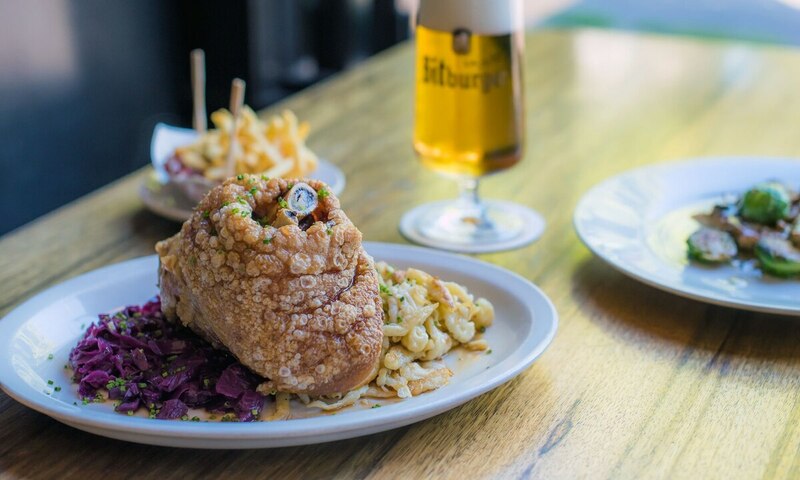 Boasting some of the finest German beer selections in the city, owner Dan Hart not only maintains a steady flow of rare imports at Stammtisch, he also oversees a restaurant serving the city's best German food. Inside the subdued beer hall with dark wood accents and wrought-iron chandeliers, you'll find the always-popular jägerschnitzel ($18) arriving at bar tops and tables, chewy seared pork loin coated in a zesty brown gravy and scattering of earthy mushrooms. Or tuck into something less popular, like the schupfnudeln ($15), doughy dumplings and tender duck confit—a rich meat that's balanced by a bit of end-of-summer brightness found in heirloom tomato and crunch corn. GO: 401 NE 28th Ave., 503-206-7983, stammtischpdx.com, 3 pm-1:30 am Monday-Thursday, 11:30 am-1:30 am Friday, 11 am-1:30 am Saturday-Sunday. $$.